The American Express gift card is offered in variety of formats, ranging from the classic gift card to cards for special occasions. In addition to purchasing the cards online from American Express directly, you can find a variety of local retailers and financial institutions that offer them. Both electronic and traditional versions are available. If you're looking for the widest selection of both traditional and electronic gift cards, purchase them from the American Express website. They are available in amounts ranging from $25 to $3,000. In addition to classic gift cards, you can find designs for special occasions or have the recipient's name embossed on the card for a personal touch. You can also order customized business versions that include personalized messages or logos. 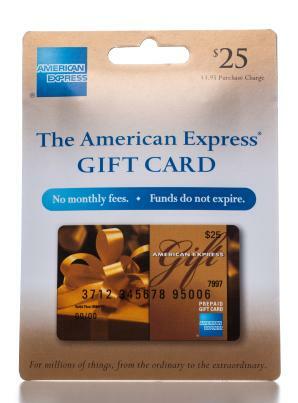 Various supermarkets, department stores, gas stations and drugstores offer American Express Gift Cards. These locations sell the classic and special occasions versions of the cards in amount ranging from $25 to $500. The specific selection and values offered depend on the place of purchase. You can find the cards at both large chains and smaller stores throughout the country, but not all locations of the participating retailers offer them. They are usually located in a special display dedicated to gift cards and are also commonly placed near the checkout area. You may also be able to purchase them online from the retailer's website. Large mail chains, including PREIT and Simon Malls, sell their own versions of the gift cards that you can use both in the mall's stores and anywhere else American Express is accepted. Some regional and national banks, including First Midwest Bank, offer American Express gift cards. Small local banks may have them as well. Since the cards may not be available at every location in your area, you should contact your local branch to inquire about availability. United States Post Office locations that carry greeting cards also sell American Express gift cards. They are available in $25 and $50 denominations. If you're not sure if one of the listed retailers near you offers these cards, the American Express website offers a product locator that shows participating retailers, malls and financial institutions near you. You can search for locations in a radius varying from one to fifty miles and view the addresses for all locations on an interactive map. In addition, an icon indicates the types of cards offered, so you can find the right one to fit the occasion.